All production machines operate with calibrated metering systems, which are checked and verified, according to controlled procedures. Roll length is regularly measured and checked on a roll ‘un-winding unit, to verify the accuracy of the metering equipment. ALL Tama netwrap complies with the German DLG standard as well as the American ASABE standard. The strength of Netwrap is all in ’Machine Direction – meaning that the thicker FRANZE tapes hold the expansion pressure of the bale. The thinner SHUSS tapes do not support the expansion pressure of the bale; they only maintain the correct spacing of the FRANZE tapes.This can be demonstrated in this way – If the thinner SHUSS tapes are cut from the netwrap on the bale, the bale will remain intact. The weight of the Netwrap per metre (g/m) is not related to how strong the Netwrap is. Higher specific strength polymers, used in the manufacturing of the net, can allow the same, or even greater strength. This can make a lighter weight roll, with the same guaranteed length, from less plastic. New technology net from Tama, is lighter and stronger, wound onto a roll with smaller diameter for easier handling. 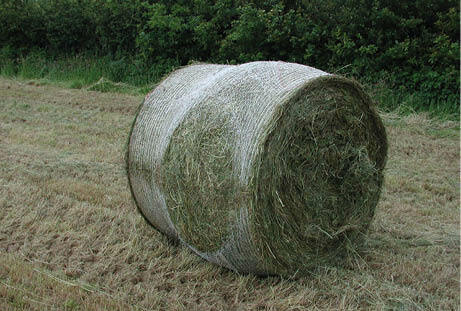 It is important that the bale shape is uniform, and flat across its surface. 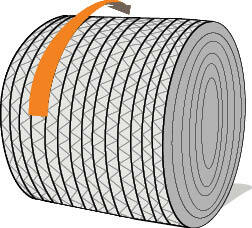 Un-even shaped bales will cause the Netwrap to be under greater pressure. It is important that the netwrap is only applied on the OUTER surface of the bale. If crop is still being picked up as the Netwrap begins feeding into the baler, some of the Netwrap will be INSIDE the bale and not ON THE SURFACE. 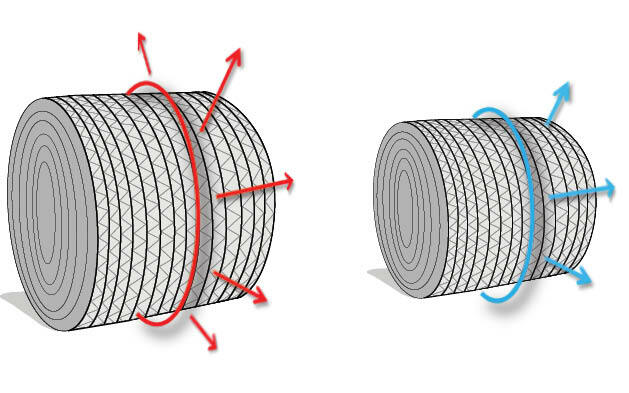 With fewer layers of Netwrap on the BALE SURFACE, the Netwrap may not be able to withhold the bale pressure and cause bales to burst open. It is important that the bale comes out of the baler immediately that the tailgate is opened, to avoid any damage to the Netwrap on the bale surface caused by the spinning rollers in the chamber. This is a common problem with any baler that has rollers in the bale chamber and on ALL types of Netwrap. The bale is not able to eject from the baler immediately due to the angle of the baler. When the baler is aligned in relation to the tractor, the bale can be ejected quickly when the tailgate opens. A bigger diameter bale gives MORE PRESSURE on the net and will require MORE turns of net on the bale. It is also important to be sure that the amount of netwrap selected by the baler-monitor, in the tractor cab, is equal to the actual number of wraps applied to the surface of the bale. Many times, the amount of Netwrap on the bale surface is not what is programmed. It is important that the correct number of wraps of Netwrap is applied to the bale, depending upon the recommended application for the particular crop. 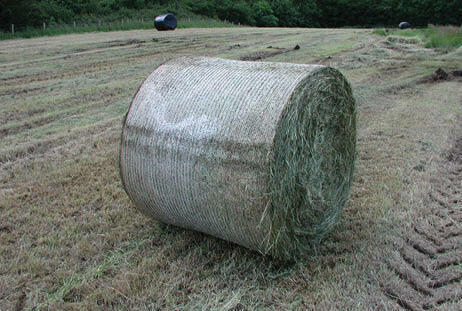 For best baling results, it is recommended to follow this general guide. 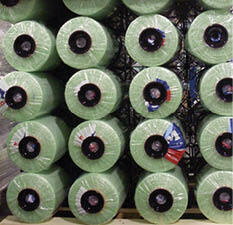 The numbers are MINIMUM recommended layers of netwrap, on the whole surface of the bale. !A combination of several extreme conditions may require a further increase in wraps. These recommendations are provided as a guide. 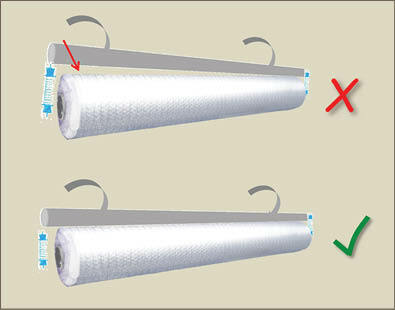 If using standard or generic Netwrap, an increase of one wrap is likely necessary to secure the bale. Check that the ends of the cardboard core are free to turn in the net box. Check and clean any snagging points in the baler, net feed tray, belts or ejection ramp, which may tear the net. 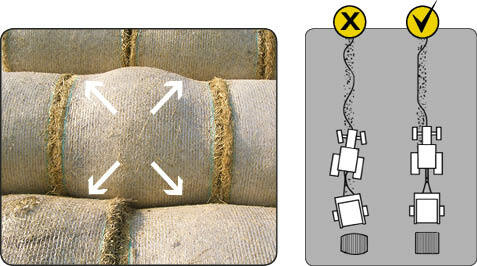 During baling, load crop into the bale chamber evenly, proceeding from side to side. After bale ejection, ensure bale is clear of tail-gate before closing. 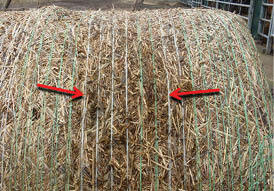 Check there is no crop between layers of net on the completed bale. Most balers have a system of rubber and steel rollers, with adjusting settings at each side. 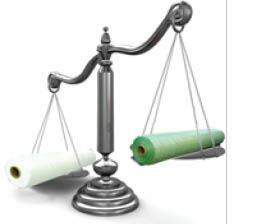 It is important that both sides are adjusted equally, providing full and uniform feeding pressure between the rollers. A simple check can be made to make sure the rollers are adjusted correctly and are fully parallel. Place a single sheet of paper between the rollers and turn rollers to pull the paper between. 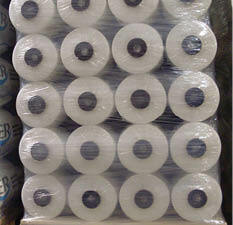 If the rollers are gripping tightly, pulling the paper out will slowly make the rollers turn. Repeat this across the width of the rollers to ensure the tension to pull the paper out is the same across the entire width. It is critical that the braking system is correctly adjusted and working, to ensure full and uniform tension across the full width of the Netwrap. Brake tension can be increased by more shims behind the fixing plate. All types of Netwrap will have operating problems at some time. Mostly this is due to baling or crop conditions, or perhaps a mis-adjustment of the baler. Below are a list of the most common Netwrap problems with recommended actions to find a solution. För att kunna erbjuda bästa möjliga service sparar vi uppgifter om ditt besök här genom s.k ”cookies”. Genom att använda vår hemsida samtycker du till användandet av ”cookies”. För ytterligare information klicka här..